Happy Thursday everyone! Have you entered my Blogiversary/Birthday giveaway yet? If not, it ends TONIGHT! Be sure to get your entries in! I apologize for the lack of posts this past week- I’ve actually been contemplating a blog move from WordPress to Blogger (I’ve already imported all of my posts, so PolishMonster.blogspot.com IS me- I’m just not active over there yet). A more ideal time to make that move would have been *before* my giveaway, but hopefully a lot of you will follow me there! I didn’t want to keep waiting to post until I finalized everything though. 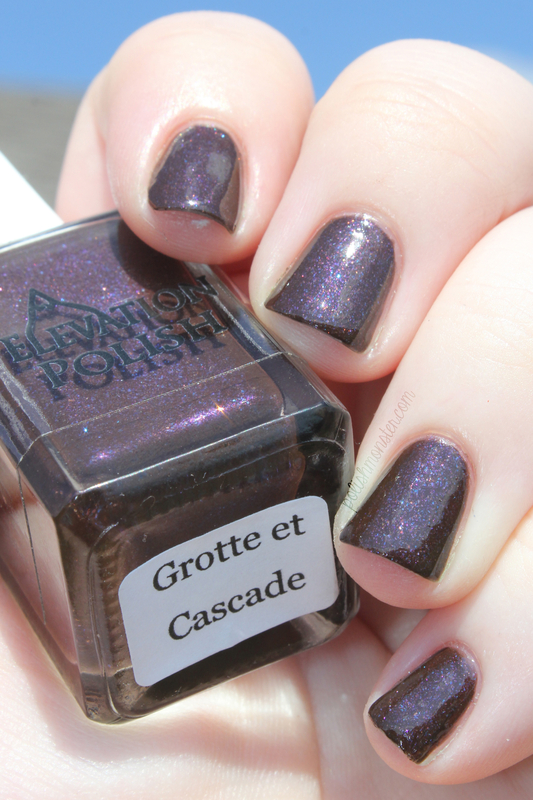 Today’s post I’m going to be showing off Elevation Polish Grotte et Cascade, Trift, and Rapa Nui. I received these 3 polishes as a birthday gift, and decided I had to show them off! First is Grotte et Cascade. 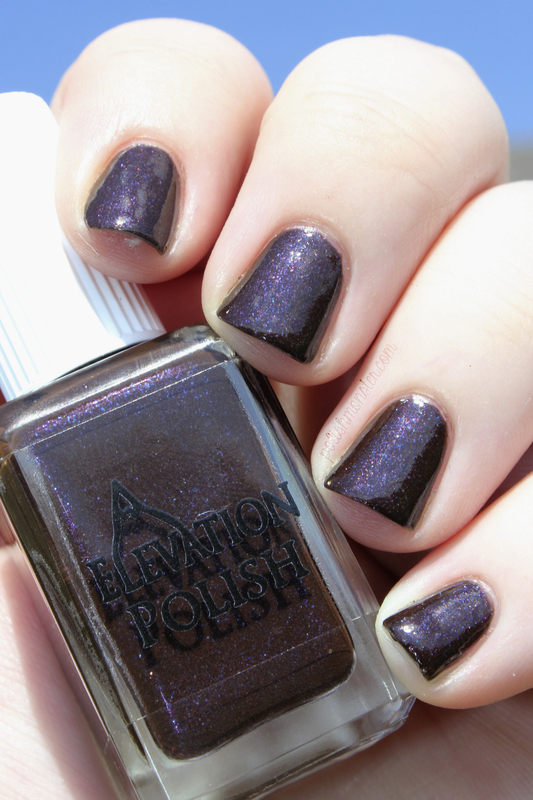 This is a gorgeous dark brown polish filled with beautiful pink and blue shimmer. The shimmer is subtle- it’s very obvious out in the sun, but when you’re indoors it tends to hide a bit. Application was great- it went on smoothly and I used 2 coats and Out The Door topcoat for photos. 1 coat gave good coverage, and 2 coats evened everything out. Then I added 1 coat of Trift on top of Grotte et Cascade! I’ll be honest- I probably would have never bought Trift on my own. I thought it was pretty, but it didn’t grab my attention like some of the others did. But I am SO GLAD I got this as a present- because I would’ve been missing out on a gorgeous topper! 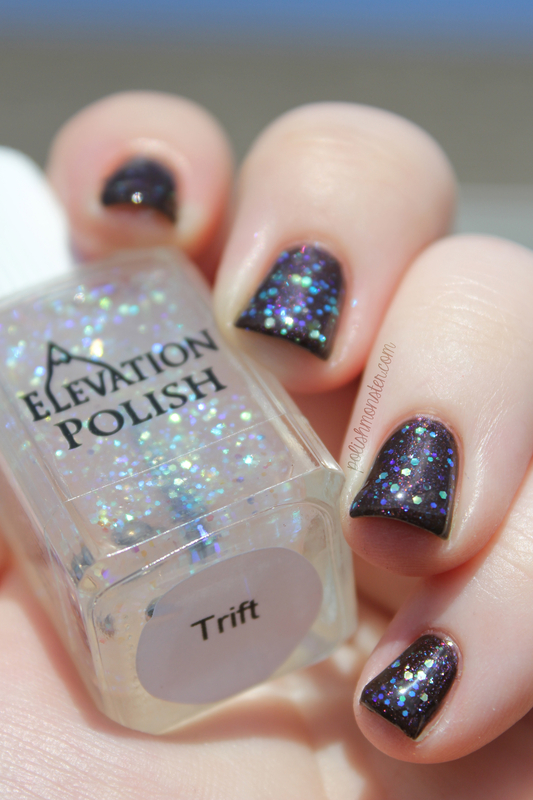 Trift is a color shifting glitter topper- simple, pretty, and very versatile. This is one of those polishes you can grab to add some ‘oompf’ to any color you own- I can’t think of anything it wouldn’t look good over! 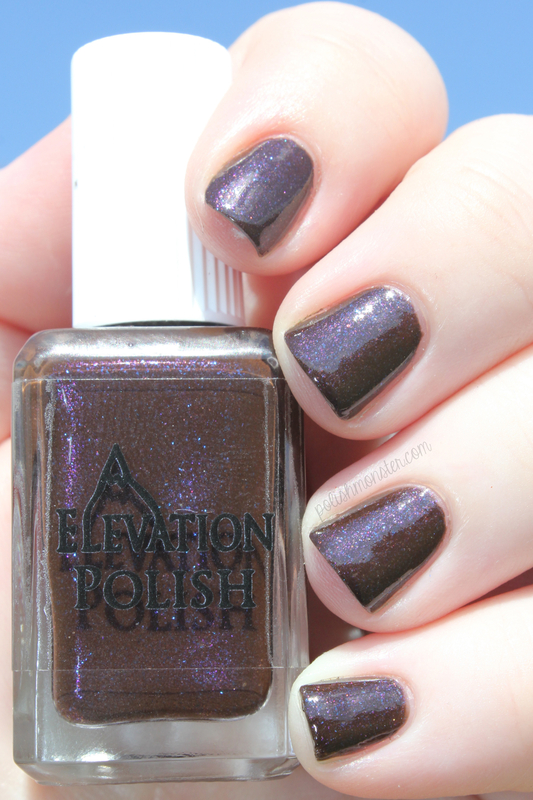 Sadly, Trift has been discontinued- BUT there are still some bottles left on the Elevation Polish website- AND it’s only $6.50! 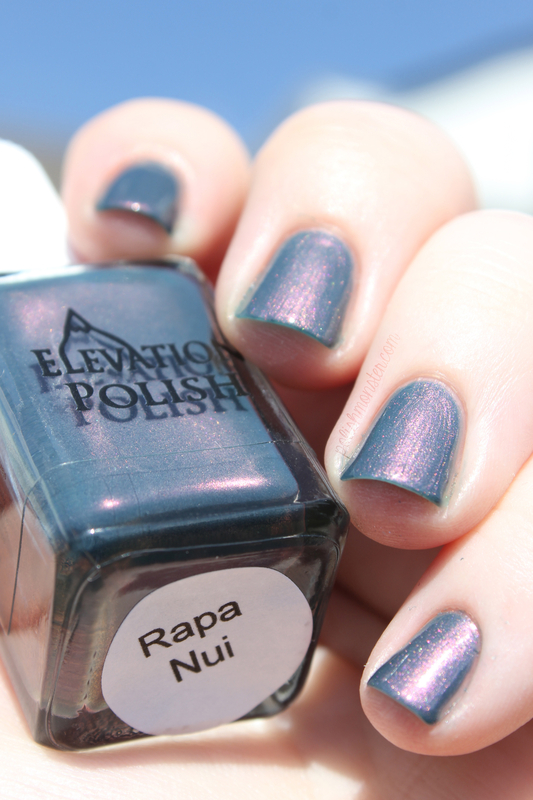 Last but not least is Rapa Nui! Rapa Nui is one of those Elevations that I never really noticed for a long time- but when I did, I couldn’t understand what took me so long. 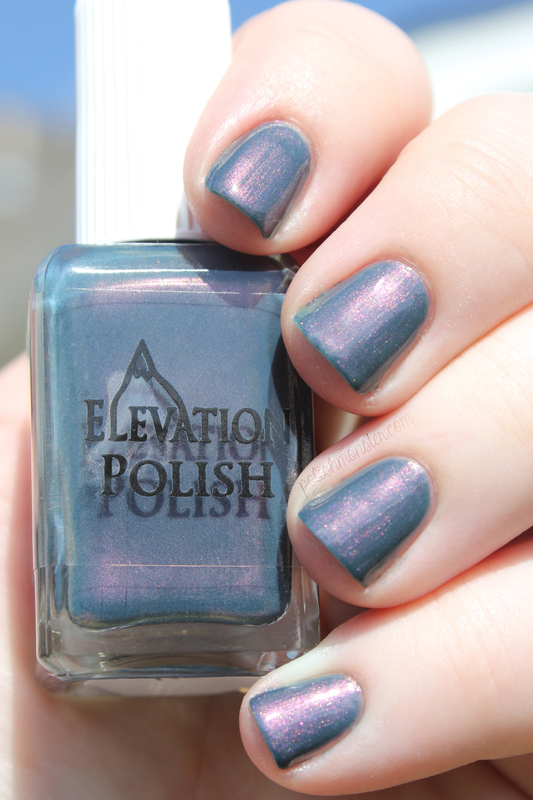 It is a gorgeous steel blue grey color with a very strong purple/red shimmer. The shimmer is incredibly strong outside in the sun, it’s a bit more subdued (but still there) inside. 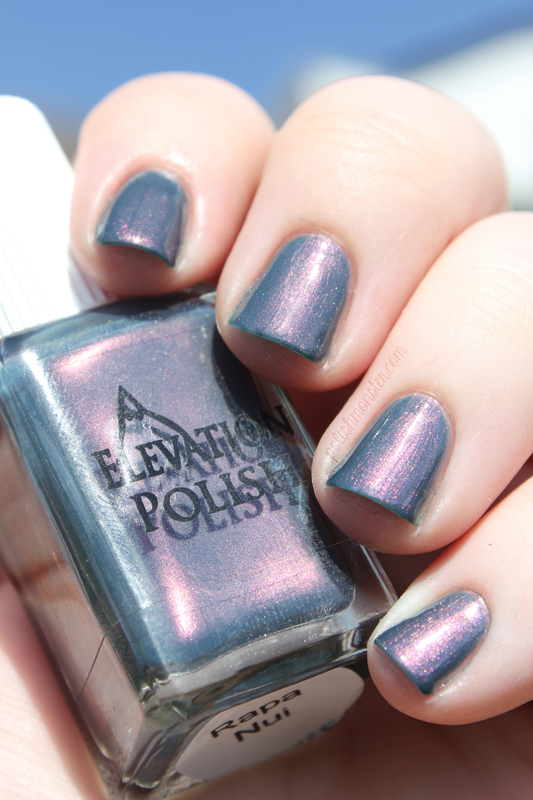 When outside, it almost appears to be a duochrome- the shimmer is that noticeable. Very, very pretty. This entry was posted on October 10, 2013 by The Polish Monster. 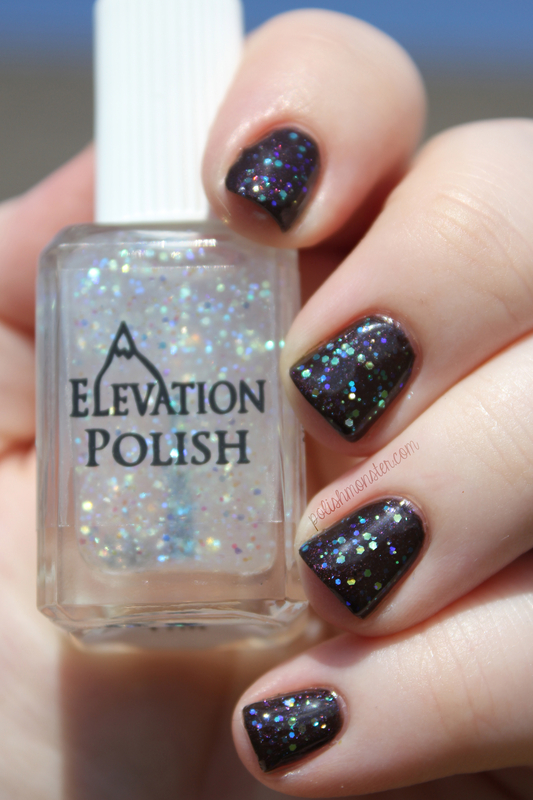 It was filed under Uncategorized and was tagged with Elevation polish, glitter, indie, nail polish, shimmer.